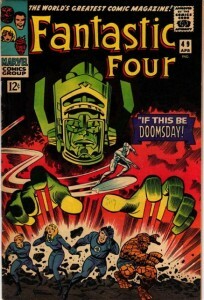 A couple of weeks ago I put up a post on Fantastic Four issues 47-60. There were some interesting things to talk about there, so I wanted to take some time and look at other silver age FF issues. Today, we’ll be looking at FF issues 30-46. First of all, what happened in these issues? 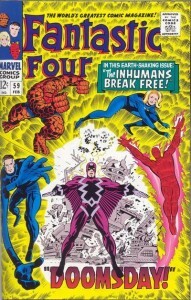 What immediately comes to mind is the first appearance of the Inhumans in issue 45. I have always loved this Kirby cover. Dark, mysterious (what are they looking at? )…a fantastic example of “The King” working his magic on this cover. Otherwise, issue 30 is the intro of Diablo, issue 31 is an early Avengers cross over, issue 33 is the first appearance of Attuma, issue 35 is the intro and first appearance of Dragon-Man, issue 36 is the first appearance of Madam Medusa and the Frightful Four (Paste Pot Pete among them…never quite understood that character), 44 is the intro of Gorgon…and so it goes. Bottom line, nothing really epic is occurring in these issues, and yet the CGC data is a little surprising. The first observation here is that there are, in general, fewer CGC graded issues of these books than those from 47-60. 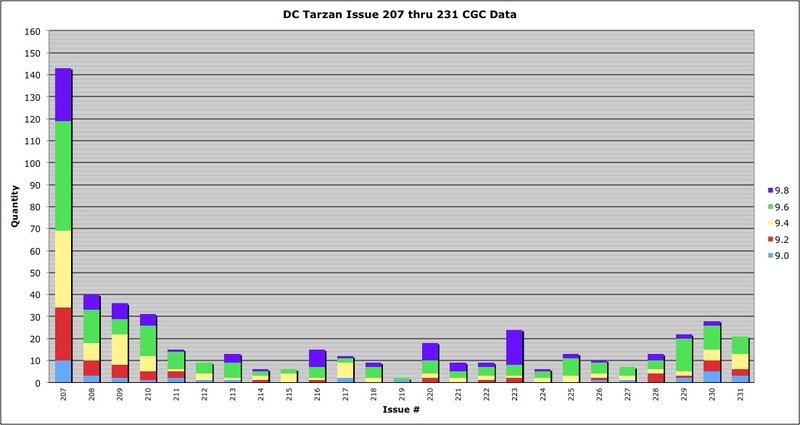 The average number of graded copies above CGC 6.0 for issues 30-47 is 220. For issues 47 -60 it is 356. (I excluded issue 48 since it’s a special case). The most surprising thing though is the spike for issue 44, and the relatively few number of issue 45 that have been graded. What could be causing the spike for issue 44? Is it really attributable to the first appearance of “Big Foot” Gorgon himself? I have to doubt that. Is it because there is a reader letter in the book from Dave Cockrum? (Had to throw that out there). No, I doubt this as well. Issue 45 on the other hand is, according to the Overstreet Guide, more prized by collectors. So, why are relatively few of that book graded compared to issue 44 and 46? I don’t know…it seems odd to me. You would think that since issue 45 is a more valuable book, more would be graded. But that’s just not the case. So…what does all this mean? From a collectibility standpoint, I think this data helps the collector make a more informed decision if confronted by, for example, issues 35 and 37 in a similar price range in CGC 9.4. Issue 37 is clearly the better value. The other obvious take-away is that high grade copies of issue 44 should not demand a premium, but they should demand a premium for issue 45. Sure enough, GPAnalysis data supports both of these conclusions. P.S. Looking for Silver Age Fantastic Four comics graded CGC 9.0 or higher? Every once in a while, a comic comes along that reminds me why I started collecting comic books in the first place. Great art, great story. With the recent series King Conan – The Hour of the Dragon, we have this combination in spades. Tim Truman, Tomás Giorello, José Villarrubia and Gerald Parel – acting on behalf of Robert E. Howard – pack a serious punch in this book. Check out a preview of the sixth installment of the series at Dark Horse for yourself. The art is reminiscent of Gene Colan with Tom Palmer, and even has shades of Frazetta, Hal Foster, and Everett Raymond Kinstler in there (this page in particular, from issue 5, reminds me of Kinstler). It is just fantastically well done. Sure, part of it is personal taste…but there is just no denying that this crew is top notch. I hope you get a chance to give this book a look. 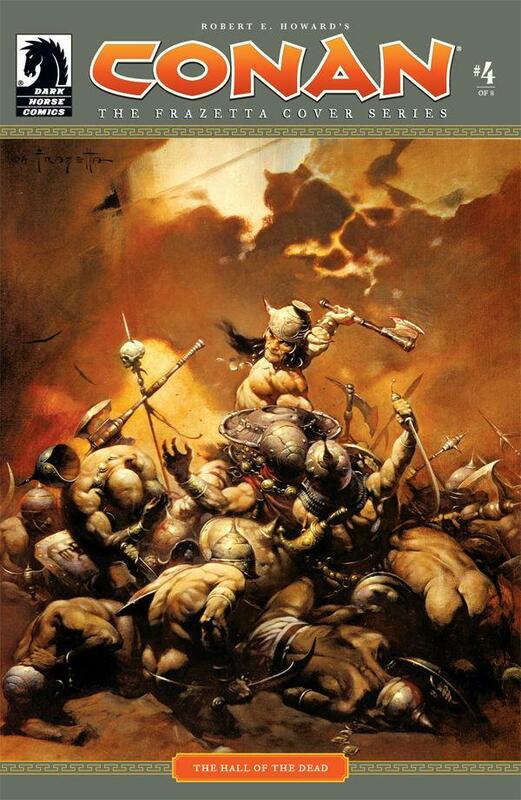 They are in the middle of an adaptation of Robert E. Howard’s only Conan novel, The Hour of the Dragon. The second half of the adaptation will commence in February…so you have plenty of time to catch up! I will just come out and say it…I am not a zombie fan. I just don’t get the fascination. But…I am a comic fan, and when a phenomenon like the Walking Dead comes along, comic fans take notice. 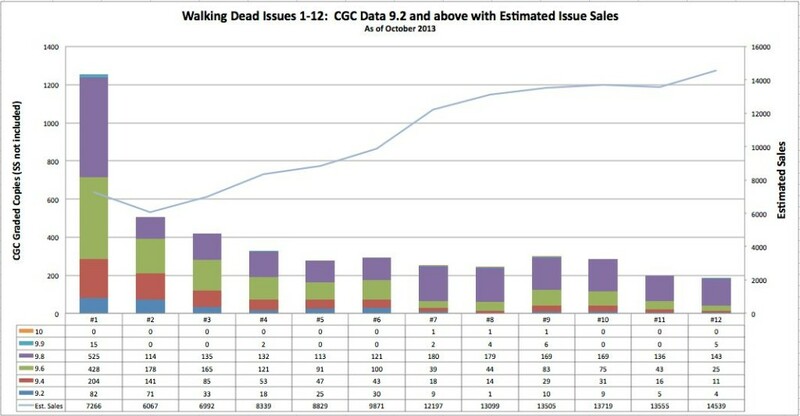 With the state of the market as it is today for the early issues of Walking Dead, I decided I would take a look at some of the data. How many copies of the book were estimated to be sold? How many of these books ended up in “high grade”? Let’s take a look, shall we? Below I have plotted all the data for CGC 9.2 books and higher (Universal Grade only). The first thing that strikes me is the low print run of the first few issues. Only 7266 copies of the first issue are estimated to have been sold. In my earlier post on Dark Horse Conan (a title that came out pretty much at the same time as Walking Dead #1) over 50,000 copies of the first issue were printed. That makes sense. Conan is an iconic character with an established fan base. Of the ~7300 copies of Walking Dead issue #1, around 25% (1713 copies…that includes Signature Series, etc.) have been submitted for grade! Sure, some of those submissions may have been the same book being resubmitted. Still, that is staggering. The second thing that pops out here are the 9.9 issues. A CGC 9.9 issue #1 sold for $11,000 in March of this year. Issues #2 and #3 have no 9.9 issues. But there are two 9.9 copies of issue #4. Neither one has been offered for sale according the GPAnalysis though. One wonders what they would fetch given the very low print run of the book even at issue 4? Along those lines, one has to ask, “Will it last?” Anything is possible I suppose, but in my humble opinion, a few years does not a cultural icon make. Batman has been around for 75 years. Spidey for around 50 years. Will the Walking Dead be on anyones radar in five, ten, thirty years?? Is there any other book to compare it to? Not that come to mind. Anyway…I hope you find this chart interesting, and maybe even useful. P.S. Looking for Walking Dead CGC books ? As I stated on the Collector’s Society boards, I don’t think this data really says anything meaningful because we just cannot say with any confidence how many raw copies of a given book are out there. Now, like I said before, I suspect that the 58 copies of Detective 27 likely represent a very high percentage of the existing known books. If you have one of those raw, then you have more courage than me! I would want to grade that thing and park it in a safe deposit box. But, regardless, there probably are known raw copies out there. Anyway…I will leave it to you to interpret this information. Ether way it is interesting to look at and ponder. 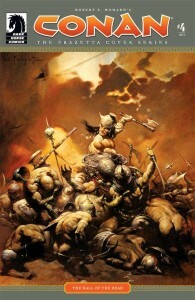 I am a Conan the Barbarian fan. There is something so black and white about the character. If you are on his side…he will be loyal, defend you to the death, and even buy you a pint of grog at the local roadside inn. If you are not on his side however, you will be met with his indignation…and his sword. All of these books are cheap in the Overstreet guide…about $3 in NM-. What is more interesting about this book (other than the primary fact that it is a great comic, IMHO), are the sales and CGC data. Looking at Diamond estimated sales for the book next to CGC 9.8 data makes for a pretty interesting study. Actually…I think this is the type of data you might see for many modern comic books. So…let’s take a look, shall we? What’s the first thing we notice? 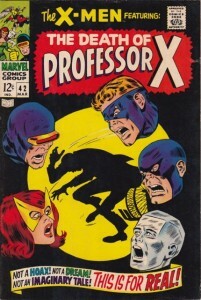 Clearly, the first issue was the most popular issue. You would expect that. 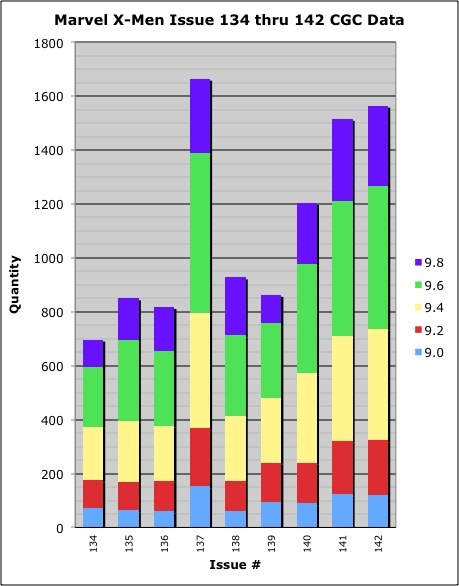 The estimated sales value in the chart, about 90,000 copies, represents first and second printings ordered over a period of three to four months. And, as you would expect, the most popular graded issue is also #1 at 127 CGC 9.8 copies. Not surprising. Let’s assume for a moment that a rabid Conan fan wants the ultimate CGC 9.8 run of these books. How easy is that going to be? Bottom line…it will not be easy. We have already spoken to issue #1. Issue #2…OK. Issue 3 and up start to get challenging. Why? This is where CGC’s statement on how to use their data should be applied. These books are obviously not rare, they just aren’t very valuable. No one has taken it upon themselves to go out and get that graded run because it would be a a lot of work, not to mention a rather expensive effort. I think we can take a couple key points away from this data. 1. Putting a high grade (CGC 9.8) run of a nominally popular title together is not an easy thing to do without resources and patience. In this Conan example, note that no copies of issue 25 (and most issues from 26-50) have EVER been submitted for a grade to CGC. So, our intrepid collector will have to take that task upon themselves. 2. 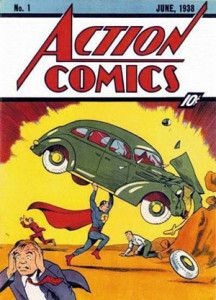 Modern comics are printed in rather small runs compared to issues from the Gold, Silver or Bronze ages. 50,000 copies a month is not a lot. The people who have taken the time to get these books graded may find, in 10-15 years time, that they hold the only viable CGC 9.8 issues in existence. Think about those tough to find, high-grade Bronze age comics that languished in quarter bins for a couple of decades. That’s a hard place for a book to live if it’s going to come out in 9.2 or 9.4, let alone 9.6 or 9.8. If you really like a modern run, and you really want it in high grade, then you had best get busy putting it together now. It will only get harder as time goes on. This was a really fun chart and post to put together. I hope to come at you with more very soon! P.S. 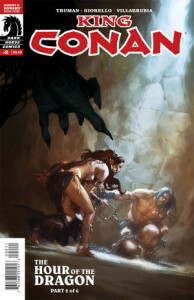 Looking for Conan CGC Comics ? I have been thinking more about the Thor data I posted a while back and wanted to try an experiment. Thor 132 has a cover date of September, 1966. 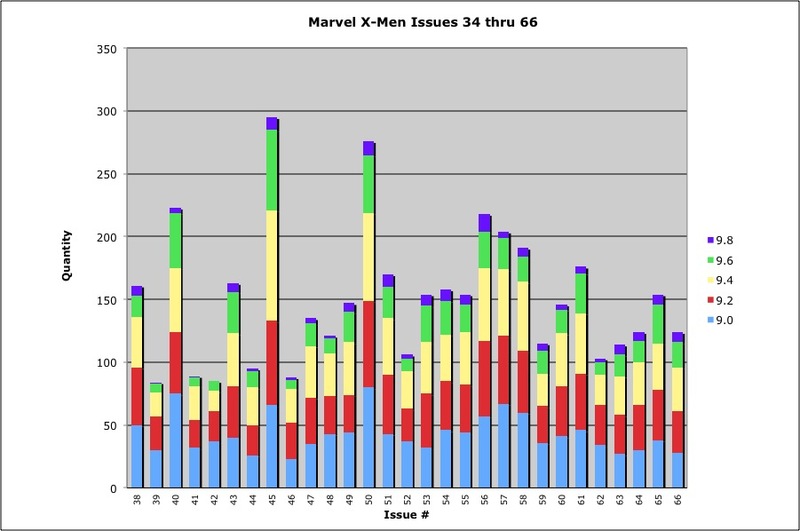 Do any other Marvel issues from that same month exhibit the same spike in graded copies? I started by looking at Fantastic Four…and to be frank, I got led down a rabbit hole that left my original question partially unanswered! 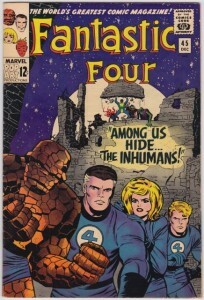 Fantastic Four 54 has the same cover date as Thor 132. 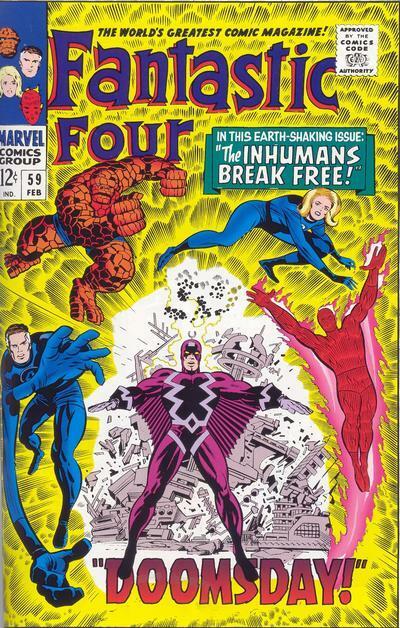 According to Overstreet, Thor 132 contains the first appearance of Ego, while Fantastic Four 54 has an Inhumans cameo in it. 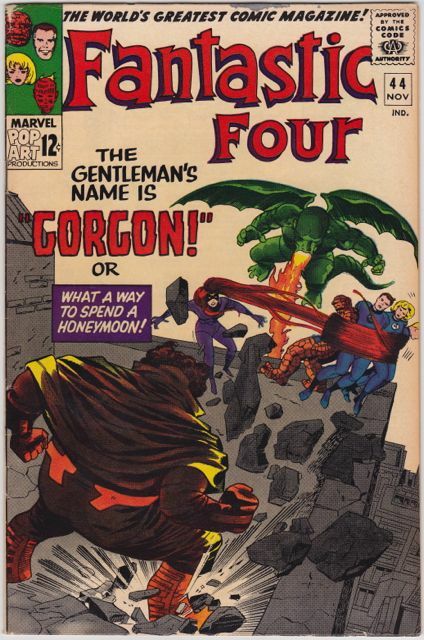 Neither of these factors seems to play much into the pricing assigned by Overstreet, with Thor 132 listing at $165 and Fantastic Four 54 listing at $240 in NM- 9.2. 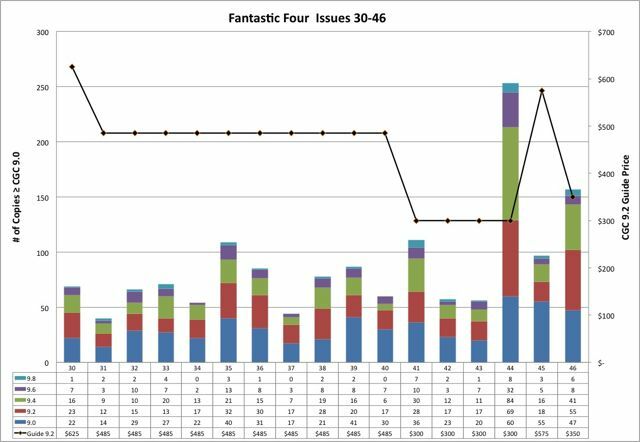 Taking a look at the data below though, there is no dramatic spike in the number of graded copies for Fantastic Four 54, so my original theory seems to be disproven (at least for this title). What else can we observe in this data? Quite a bit actually! For starters, one expects the spike for issue 48. This is a key book (the first Silver Surfer) and it guides for $1500 in NM- 9.2. Oddly though…the trend does not continue through the Silver Surfer story arc (issues 49 and 50). 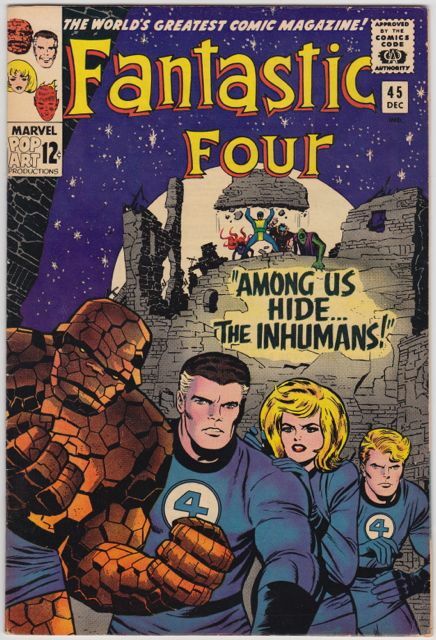 Notice that there has never been a CGC 9.8 grade assigned to a copy of Fantastic Four 49. Issue 51 on the other hand, which Overstreet calls out as having a classic Lee/Kirby story, “This Man…This Monster”, also has no 9.8 graded copies, and only 60 copies at 9.0 or higher. This book guides at $425 in 9.2, so if there are high grade copies out there, it would make sense that they would be submitted. Moving along to issue 59, which is nothing particularly special according to Overstreet, we see another spike to over 350 above 9.0, even though the 9.2 guide price is just $200. Could it be that this spike somehow relates to the Thor 132 spike?? I doubt it, but it is a possibility. So…what does it all mean? Clearly, if you are trying to put a high grade run (9.6 or better) together for Fantastic Four…you will have a tough road to hoe. Just looking at this set of 14 issues makes that clear. 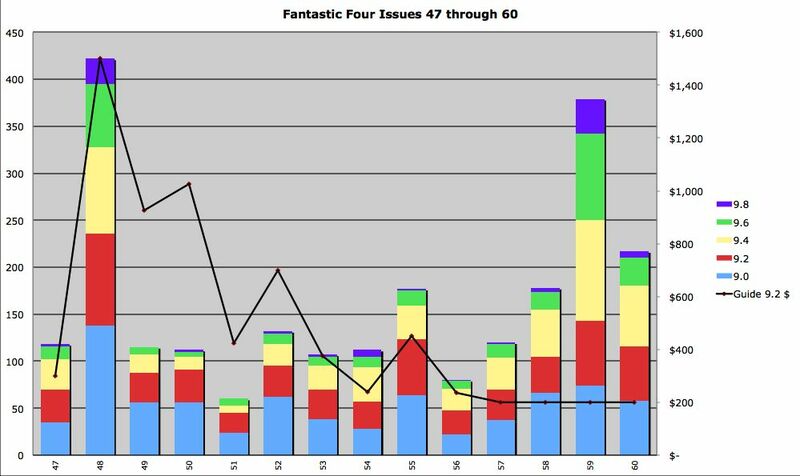 And regardless of your intentions…the data makes it clear that if you come across an issue of Fantastic Four 59 in CGC 9.8, for example, you should expect to pay less for that issue than for issues 58 or 60. It’s simply supply and demand. (For what it is worth, GPAnalysis data does support this conclusion to some extent). I will continue to expand on this data and see what other things we can conclude. I hope you are enjoying these posts. They are actually a lot of fun to research and to write! When a collector buys a given comic book, what drives that decision? In my experience it can be a lot of things. I am putting a run of that title together, it’s a cool cover, it has art from an artist that I like, it’s a quirky book I’ve not seen before, etc. All of these things, and more, have influenced my buying decisions at one time or another. Often though, I will buy a comic just because I know it is rare. It may not be a very interesting book, but if it is pre-1954 and it has managed to make it to 2013, I almost feel an obligation to protect it. How do we define rare in this hobby? Ernst and Mary Gerber, in their fantastic reference, The Photo-Journal Guide to Comic Books, say a comic book is “Rare” when between 11 and 20 copies are in existence. This scale was created pre-internet when locating collectibles was much harder than it is today. So what do we, or should we, call “Rare” today? A brief look at a few key Golden Age books gives a hint. 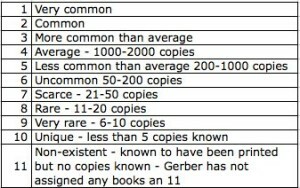 Take a look at the table below showing these milestone books with their Gerber scarcity number and the current number of CGC graded books. I could have picked other books here, especially books in and around these milestone issues. From Detective 1-30 for example, there are a few issues with less than 15 graded copies. I chose the issues above because I suspect that most, if not all, copies in existence are slabbed. If someone has a Detective 19 though, it might reside in their collection as a “raw” book. So what do all these numbers say? 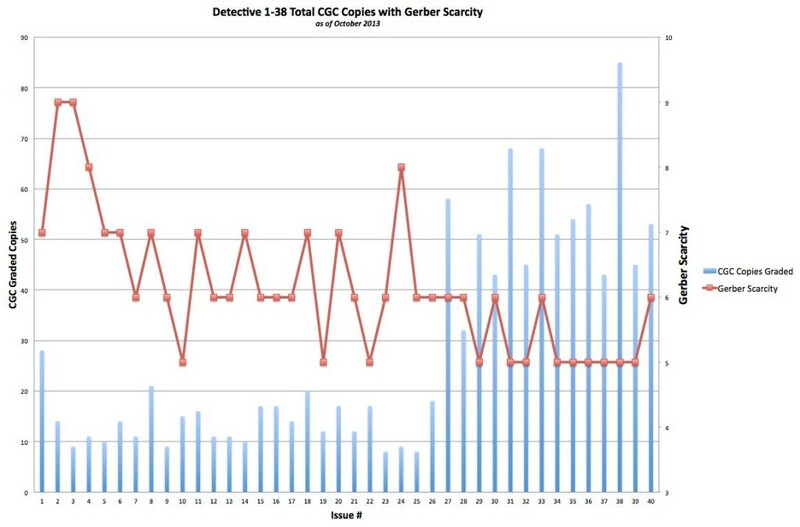 For starters, they say that Gerber was pretty accurate in his estimate for Action 1, and maybe a little less so with Detective 27. One could probably make an argument for Gerber 7 on that book. 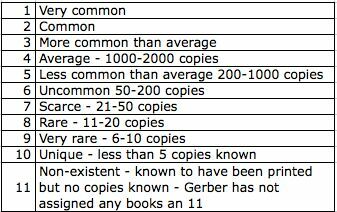 As for All Star 8 (a book that lists for $80K in the guide in NM- 9.2) it probably should be considered a Gerber 6. 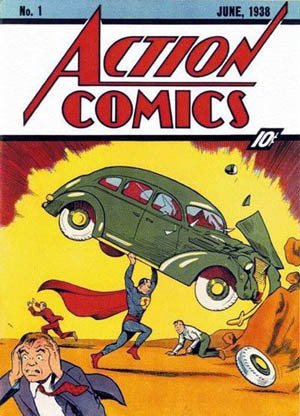 For a book like Walt Disney Comics & Stories 31 (~$8,000 in NM- 9.2) it’s likely that a lot more “raw” copies of this book exist than do copies of Action 1 or Detective 27. However, I suspect a Gerber 5 rating is still too low. In addition to the specifics on these books, I think we can draw a more general conclusion about the Gerber scale and its application today. Is there any doubt that Action 1 or Detective 27 are “Very Rare” books? I don’t think so. I suggest that it might be time to reevaluate this scale to more accurately represent the data that has been gathered as part of the CGC database. What do you think? P.S. As an aside…2018 copies of Amazing Fantasy 15 have been graded by CGC. Even taking into account multiple submissions of the same book, it is clear that this is not a “Rare” book. A book in demand? Sure. A rare book? No. It’s been a while since I posted here…I have been busy working on my Disney Postcard blog and just don’t have the horse power to support multiple blogs! But, I want to make an effort to support this blog a little more regularly and see where it goes. So…off we go! 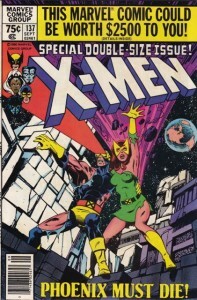 In my previous post I was looking at X-Men issues in and around issue 137. There are a LOT of those issues that are graded. It would be a bit of a stretch to call any of them rare. But what of the earlier issues in the run? The story is indeed rather different! 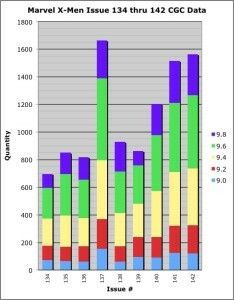 I took a look at the data for CGC books graded between issue 38 and issue 66. 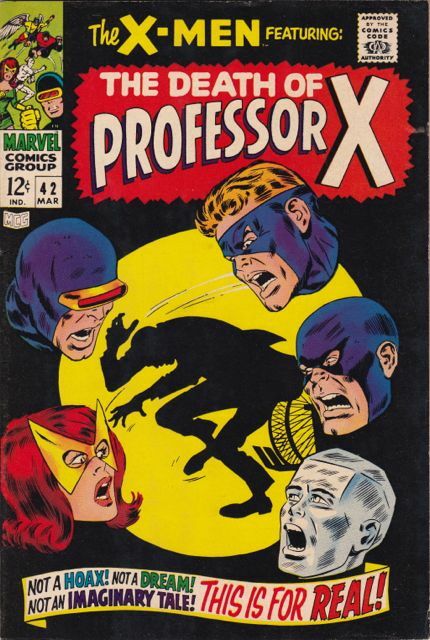 Most comic fans know that issue 66 is the last original X-Men book from the Silver Age…issues 67 thru 93 are reprints and issue 94 starts the “new” X-Men. What do we see in this data? For starters, it’s fairly obvious that there are significantly fewer CGC graded X-Men books between issues 38 and 66 than for later bronze age books. Maybe this is not that surprising. But the fact that there are, on average, 150 CGC graded copies for issues between issue 38 and 66 vs. an average of 815 CGC graded copies for issue 94 thru 142 is surprising. Bottom line…Silver Age X-Men are significantly more rare than the Bronze Age books from the run. In addition to this…you can see the obvious disparities in rarity between various of these issues. Looking for a CGC 9.8 copy of X-Men 42? Not gonna happen…there are none (probably due to the cover being predominantly black). As a matter of fact, CGC 9.8 copies are not common in this range, with an average of only ~6 copies for each issue. That’s not a lot. Do you find this data surprising? Let me know if you do, or don’t. In the near future, I am going to take a look at some other titles and see what the data shows. 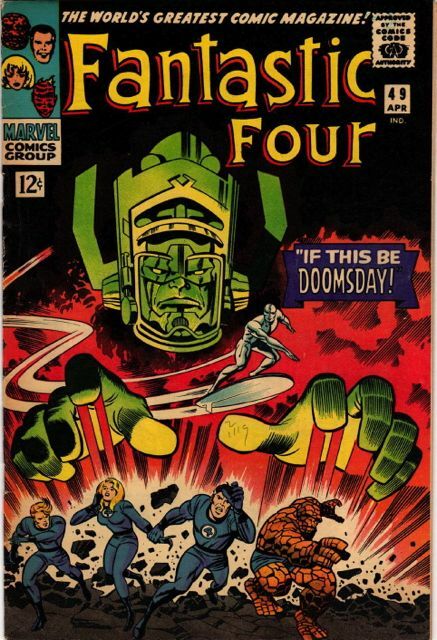 A look at Fantastic Four would actually make a fascinating comparison, because the Bronze Age FF books are not anywhere near as popular as the Silver Age books (this is the opposite of the X-Men case, where popularity for the title exploded in the Bronze Age). I started collecting comics in the fall of 1985. It was actually a great time to get into the hobby. Books were still fairly cheap compared to today’s standards, and Golden Age valuations were only starting to go up significantly. The first comic I ever bought was a book called “Robotix”. It was a toy promotion comic…but it as the first issue…so I bought it. Needless to say, it didn’t last…so I soon gravitated to other titles, one of which was the X-Men. Hearing stories about how great the title had been in the past…I started gather up back issues…soon building a complete collection from issue 94 (intro of the new X-Men) to present. Today I have them all, back to issue 1, and there are few interesting stories to tell regarding rarity and these books. Rarity wise…the chart here doesn’t have as clear a story to tell as some of the other charts I have presented, but there are still facts to take away. Because of the popularity of these issues…there are plenty (hundreds) of issues 137, 141 and 142 in 9.8 or higher. In fact…while I did not plot it here, there have been 6 copies of issue 137 graded at 9.9! So…if you are so inclined, you may be able to find one of those. 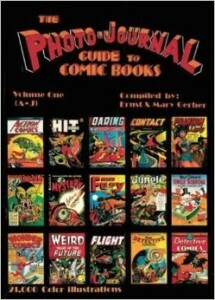 Second…it is worth noting that compared to the other books, issues 134 and 139 have fewer 9.8 graded books. There have still been over a hundred issues of each graded 9.8, but this compares to 274 for issue 137, 305 for issue 141 and 299 for issue 142. Bottom line here…getting an issue of X-Men 137 in CGC 9.8 should not be hard (there are several copies on eBay right now). Finding other issues around #137 should also not be difficult, but realize that some of them will be significantly less common. P.S. Looking for X-Men 137 in CGC 9.8? 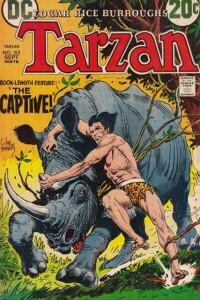 Today I wanted to post on another one of my favorite titles…the DC run of Tarzan by Joe Kubert. These are just fantastic books – good storytelling wrapped in stylistic art work that keeps the reader wanting to turn the page. Of course, he was working with great source material in Edgar Rice Burroughs’ character, but new life is injected here that is well worth the relatively inexpensive cost of entry (you can put an unslabbed set of these books together for a very reasonable sum). DC started this series in April of 1972 with issue #207, and while I cannot speak to it’s commercial success, artistically I think it was another example of very solid work for Kubert on a monthly title that was entirely his artistic responsibility. Looking at the CGC stats on these books up through issue #231, the collector is faced with both an opportunity and a dilemma. Issue #207, being the first in the series is no problem…plenty of issues are available in high grade and at fairly reasonable prices if you search on eBay. The problem comes as you try to assemble a high grade set of the books. These books list for $25 in NM- (9.2) in the Overstreet guide (2012-2013). Even if someone has a super nice copy, they may not send it in…and that is evidenced here. Finding a copy of issues 214, 215, 219 or 227 is a real problem. You will have a better chance trolling comic shops for a nice copy that you can send in, instead of waiting for a copy to show up online that has already been graded (assuming it is still slabbed). And that’s the opportunity, I think, for this title and many like it. There may come a time when people realize that there aren’t that many of these books out there in high grade because they have spent the last forty years languishing in regular bins at comic shops around the country. Of course, there may never be a high demand for this book…but if one develops, and the books aren’t there, then the prices will head north. This is, of course, all speculation…there could very well be untouched stacks of each of these books in some warehouse somewhere. Time will tell! Otherwise, there are a number of other oddities to speak to here. Check out the spike of 9.8 copies for issue 223. And why no 9.8’s for issue 231? I will leave you to ponder these things on your own! For a list of what is currently available online, check out these current eBay auctions for CGC DC Tarzan books.